Competitors. You’ll want to stay abreast of what they’re doing on social media to know what campaigns they are running and what appears to work for them in getting their communities engaged. Influential bloggers and journalists who cover topics in your industry. You’ll want to listen for opportunities to build relationships with them. That can mean anything from sharing their content when it’s relevant to your audience or simply answering questions when they are looking for answers. VIP customers. Social media can be a great place to nurture brand evangelists. You’ll want to look for opportunities to show these customers you care. It can be a thank you for mentioning you, or a bigger gesture of gratitude like a freebie of some sort. Or you can simply show you are listening by jumping into their conversations where it makes sense (and without sales pressure). So…how do you make sure you don’t miss one of those opportunities? Simply following them on social media won’t work. Their posts will be drowned out by the other thousands of people you follow. Here’s how you can use Rignite to single these folks out and make sure you are on top of the posts by the people who matter most. In this example, I’ll show you how to monitor influential bloggers, but the same approach will work for monitoring your competitors and your VIP customers. In the Monitor module in Rignite, click the + sign to add a search stream. 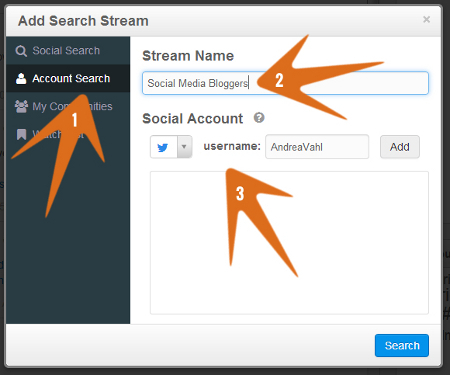 In this example, we’re adding Andrea Vahl’s Twitter profile to our stream of Social Media Bloggers. She also has accounts on Facebook and Google Plus that we can add. Hint: If you don’t already know the user name of the person you’d like to follow, it usually appears in their profile URL, as shown below. Now that we’re all set up to monitor all of Andrea’s social profiles (and alter egos), let’s take a look at our new stream. When we check out our new Social Media Bloggers stream, we see two potential opportunities to engage. In the top post, we see Andrea’s alter ego on Facebook posting a tip to re-share your evergreen content. This is certainly an opportunity to engage in a conversation where we can add value. Or if we’ve already built up a positive relationship with Andrea and her community, it might just be the right time to post a comment about the handy features we have that make it easy to schedule out re-shares of your content well into the future. 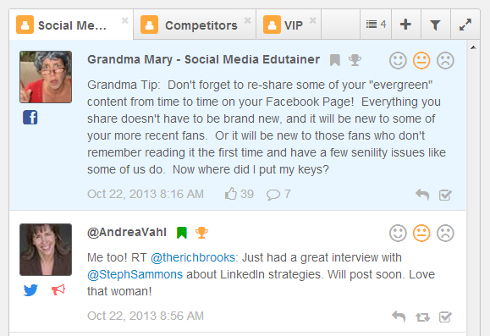 In the second post, we see that Andrea is in cahoots with another blogger working on a piece about LinkedIn strategies. If we have an article on that topic, it could be a great time to offer it up as a useful resource to link to in their post. Now, you’re all ready to create your own streams. 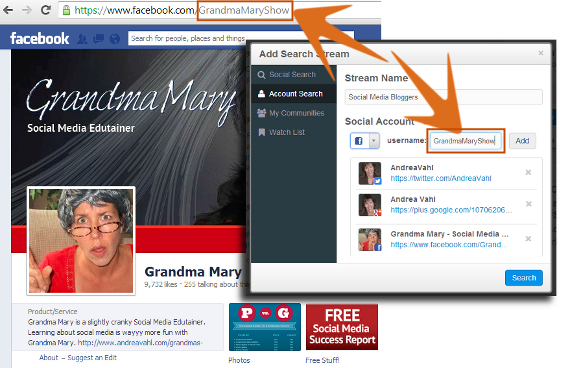 You can add as many people as you’d like and monitor all their social profiles from one stream. Or you can create separate streams for the different types of people you want to monitor. As you can see in the screenshot above, we’ve added a “Competitors” tab and a “VIP” tab for tracking those accounts separately. Tell us…What types of people will you monitor? And how will you engage with them?